This article is about the microgame in WarioWare, Inc.: Mega Microgame$!. For the Wario Land 4 song known as "Sunny Side up" in the Japanese version, see Karaoke (Medamayaki). Info Crack the egg and drop it into the middle of the pan! Egg-cellent! Sunny-Side Up is a microgame in the Strange folder in WarioWare, Inc.: Mega Microgame$! At the bottom of a screen, a frying pan is moving back and forth. At the top of the screen, there is a stationary egg. 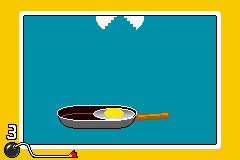 The player must hit the button with good timing to crack the egg and make the yolk fall into the pan. The game gives some leeway on the timing, as the egg slides into the pan if it hits the edge. 1st level difficulty: The pan is very large. 2nd level difficulty: The pan is roughly two-thirds of its original size. 3rd level difficulty: The pan is roughly one-third of its original size. This page was last edited on September 27, 2018, at 13:33.